With space to accommodate up to 125 seated guests and 200 guests for standing cocktail receptions, the Atrium is the perfect venue for social and corporate events. 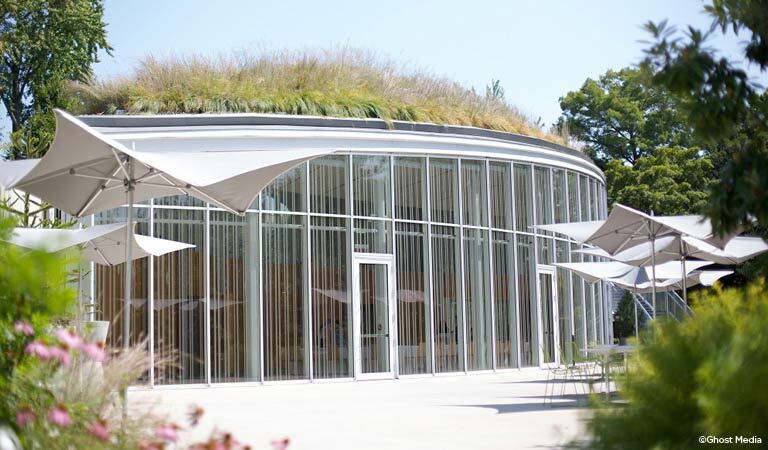 The Lillian and Amy Goldman Atrium is Brooklyn Botanic Garden's stunning new event space. Beneath a lovely and ecologically sustainable living roof, the floor-to-ceiling glass walls look out onto the Garden's Cherry Esplanade and an outdoor terrace. The unique culinary artistry of Executive Chef Jacqueline Kelly and Chef de Cuisine Morgan Jarrett will ensure that your event is memorable for every guest. Following the booking of your event, a complimentary tasting gives you the opportunity to design your custom menu. Whether you’re looking for an elaborate 4-course meal, or hosting a meeting with light snacks and breakout sessions, every dish will be adapted to perfectly match your event. Our dedicated and professional catering team work with you from the beginning to determine the best layout and run of show for your event. The Atrium can be set to accommodate meetings, presentations, and receptions and seamlessly transition between them. You may choose to enjoy cocktails and hors d’oeuvres on the terrace while we reset the room from wedding ceremony to reception or design the floorplan to accommodate the perfect party for any occasion. Regardless of your needs, our experience combined with a unique venue will make your special event possible.